While the plight of the South African refugees may not be front page news at the moment, they are in need of the basics to survive their desperate plight. ABM recently wrote to the Bishop of Wangaratta appealing for assistance for the Sudanese refugees who are fleeing the fighting between rebels and the South Sudan military especially in Twic East Diocese. The Bishop of the Horn of Africa is appealing for emergency food relief for these displaced people and with that in mind, the parish of St George’s held a Mission Dinner on the 17th May to raise funds to send to the Bishop for distribution as needed. 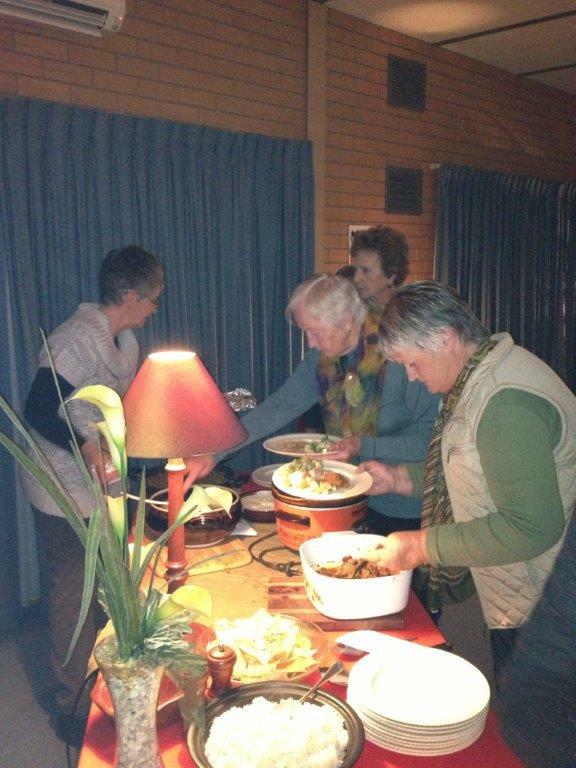 Diners enjoyed a meal of Ethiopian food cooked by the parishioners. Ethiopian food is traditionally spicy or peppery meat and/or vegetable dishes called Wat’s and served on large Injeras (pancakes made from a seed similar to buckwheat). During a communal meal, each diner tears pieces off one large Injera wrapping it around the stew-like Wat. The portion resembles a cigar which is eaten as finger food although the diners at the Mission Dinner used knives and forks as is our western custom. Fruit is not plentiful but they do have mainly melons. Honey is used as a sweetener for pancakes or Honey Wine. 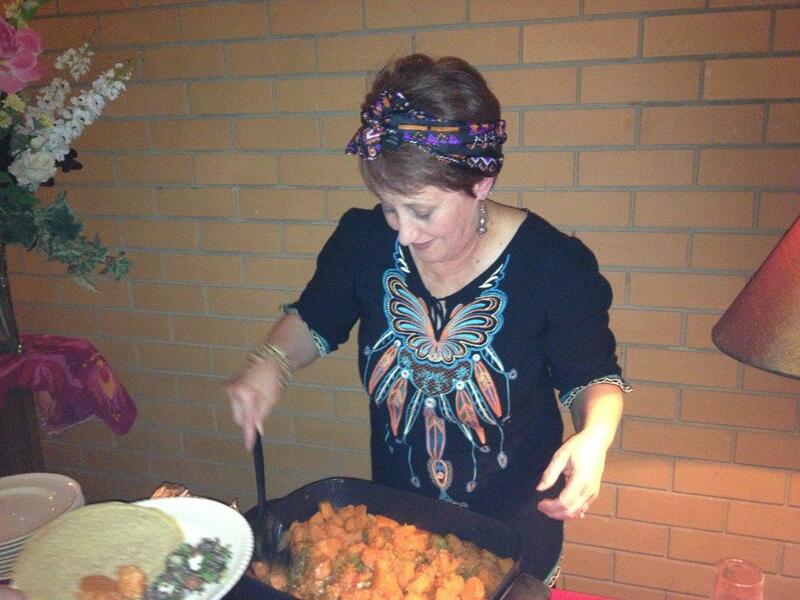 The food is spicy but some dishes were modified to suit our western palate. Meat can be lamb, chicken, goat or vegetable (mainly root vegetables however the dishes served for the dinner were lamb, chicken and vegetable). 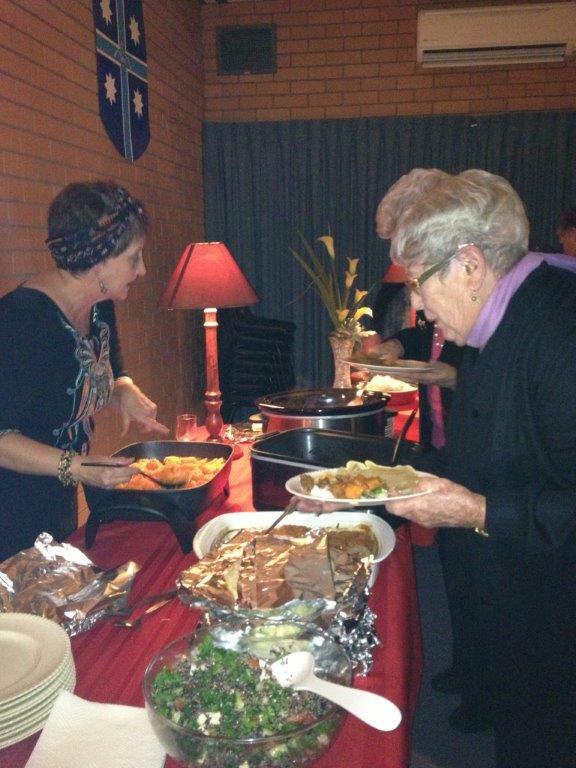 The diners at the Hamon Parish Centre enjoyed the restaurant atmosphere of subdued lighting, decorations and the red/brown hues of the desert reminding them of the richness of the African landscape and the people who are now in desperate need.